You don’t have to be Irish to enjoy St. Patrick’s Day and all that goes along with it. 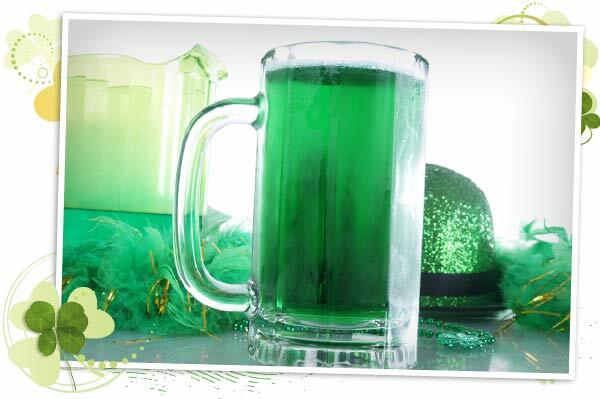 From corned beef and cabbage to shamrock shakes to emerald-green beer, St. Patrick’s Day is a delicious celebration from beginning to end. Though the Irish likely shake their heads at those who are silly enough to dye their beer green, you won’t be alone in indulging, as you’ll see the emerald brew everywhere you look on St. Patrick’s Day. Though there’s no definitive answer for where the idea for green beer originated or why it’s become so popular in North America, a custom called “drowning the shamrock” might be at the root of the tradition. So, are you ready to drown your own shamrock? Let’s make green beer. It’s just as easy as you’d imagine. Place 4 to 6 drops of green liquid food colouring in the bottom of a pint glass or beer mug. I used Wilton gel food colouring. Pour your ice-cold beer directly over the food colouring. You could choose a true Irish lager like Harp’s or opt for an Irish-style lager like Rogue’s Irish Lager; just be sure you don’t use a stout. Even though this is what you’d find in most true Irish pubs, a stout is thick and dark, and any food colouring you mix into it will just get lost in its rich, dense deliciousness. You shouldn’t need to stir your beer, as the food colouring quickly disperses when you pour the beer over it. But if you do, be sure to use a plastic spoon, since a regular spoon will flatten your beer.